Axis ticks are the small marks that identify the position of items on the axes and the starting points of gridlines. Vertical ticks are controlled by the XAxis and horizontal ticks are controlled by YAxis and YAxis2. Ticks can be "major", e.g. falling on the labeled axis Step values. "Minor" ticks fall between Step values for YAxis and YAxis2. See the figure below where major ticks fall on 50, 100, 150, 200, 250 of the YAxis and minor ticks fall between the major ticks. Visible : Set this property false to hide the ticks. Cap : The terminator for each tick can be Flat, Square, Round, Triangle, NoAnchor, SquareAnchor, DiamondAnchor, ArrowAnchor, AnchorMask or Custom. In the example above the Y Axis major ticks have a Square cap, minor ticks have a RoundCap and X Axis major ticks have an ArrowAnchor cap. Color of the line and cap. Length: The length of the tick in pixels. To reverse the direction of the ticks and have them appear above the axis line use a negative value for Length. PenStyle : values can be Solid, Dash, Dot, DashDot, DashDotDot and Custom. The LayoutMode property of each the X axis object specifies how axis marks are positioned with regard to series items. 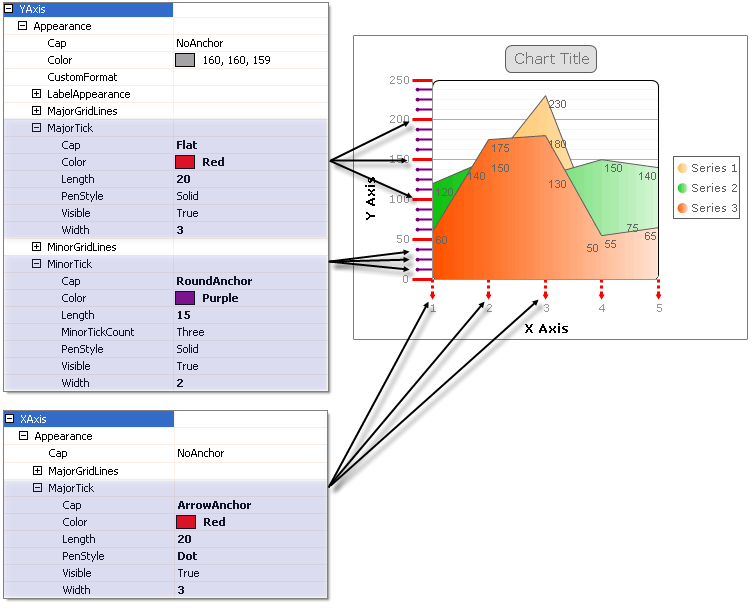 Layout modes change the chart appearance while the underlying data remains the same. The available LayoutMode values are Normal, Inside and Between.